The “Umbilic Torus NC” is a sculptural expression of timeless mathematical theorems in new silicon bronze created by Helaman Ferguson in 1987-88…He developed three real dimensional equations to get the umbilic torus in a sculpture-like space, computed normal vectors, tool offset vectors, and an NC (numerically controlled) tool path. Apparently, Trent had the same calculus book. 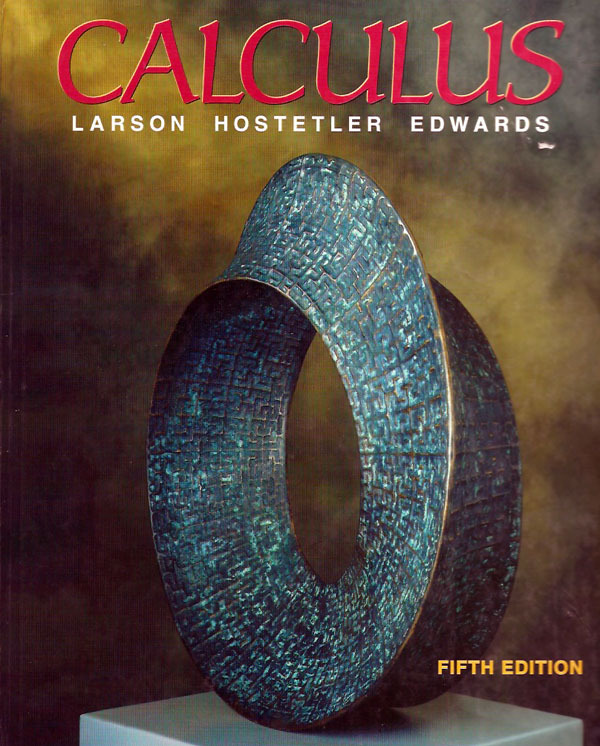 Or at least one of the many editions in the same franchise that feature an umbilic torus as cover art. Like a Möbius strip, an umbilic torus has only one side, and only one edge. Its cross-section, which has three-fold rotational symmetry, turns through 120 degrees before meeting itself again. 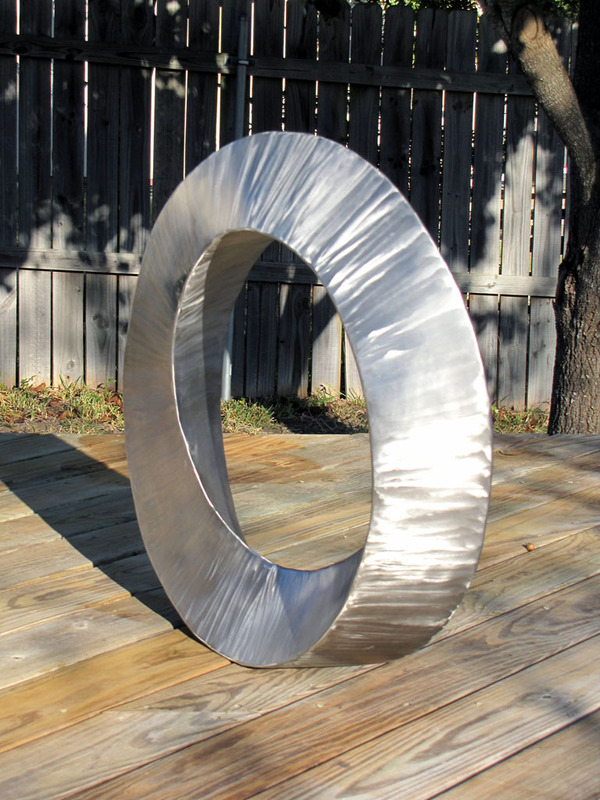 To be picky, Trent’s sculpture is not a “proper” umbilic torus because its sections are equilateral triangles instead of hypocycloids. But whatevs. Trent’s version is still beautiful, perhaps all the moreso because it was made by hand instead of using CNC equipment. Trent’s method, recounted here based on his explanation, is pretty much summed up by the in-process shot above. Bend a round steel rod into a circle. String 60 sheet-metal triangles onto the rod, like beads, through their centers of rotation. Close the rod into a continuous ring by welding it shut. Distribute the triangles evenly around the ring, rotating each two degrees further than the one before, and weld them in place. Bend and fit a smaller-diameter round steel rod to the vertices of the triangles, forming the torus’s single continuous edge. Weld it in place. Lay cardboard over the edges of the triangles and trace the profile of the surface on it. Cut these out and number them, keeping track of where each profile goes on the frame. Use the cardboard profiles as templates to cut pieces of sheet steel. Weld the sheet steel “skin” pieces into place on the frame. Clean up the seams and rough spots with a die grinder. Coat everything generously with clear lacquer. A detailed mathematical description of Helaman Ferguson’s original umbilic torus was published in The American Mathematical Monthly in 1990. If you dig this, you’ll probably dig George Hart’s Math Monday columns.